Apple Inc.'s mobile-phone shipments and market share in India plunged in the April-June period from a year earlier, according to US-based research firm Strategy Analytics, highlighting the challenges the iPhone maker faces in the world's third-largest smartphone market. The company shipped 800,000 smartphones in India in the second quarter of 2016, down by a third from 1.2 million the same period last year. Its market share in the country fell to 2.4% from 4.5% during the period, Strategy Analytics said. "Apple iOS will need to reduce iPhone pricing to cheaper levels, attract more operator subsidies and enlarge its retail presence through Apple stores or online channels if it wants to regrow significantly in the future," said Woody Oh, director at Strategy Analytics. The data comes barely a week after Apple CEO Tim Cook told analysts during a quarterly earnings call that the company's iPhone sales in India jumped 51% during the first three quarters of the company's financial year that ends in September. Cook hadn't specified the number of units sold in India during the three quarters. He also hadn't given sales growth numbers for the third quarter, unlike the second quarter when he had said that sales in India surged 56% in the three months to March 25. Apple has been trying to boost sales in India and has sought government permission to open retail stores in India, the world's largest smartphone market after China and the US, but its proposal is stuck in bureaucratic red tape. The company has also announced a first-of-its-kind design and development accelerator to support Indian developers creating innovative applications for iOS and has opened an office in Hyderabad to accelerate maps development. Still, Apple trails South Korean electronics giant Samsung, China's Lenovo and local handset makers such as Micromax in the country's booming smartphone market. Indeed, India's overall smartphone market grew 19% in the second quarter to 30.7 million units, according to Strategy Analytics. Growth was powered by Android devices with shipments rising 28% to 29.8 million smartphones. Android's market share grew to 97.1% in Q2 2016 from 90% a year earlier. 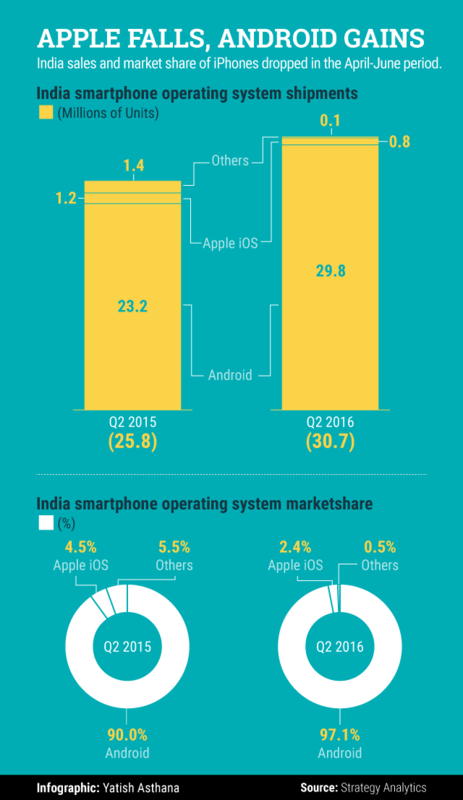 "Android dominates the India smartphone market and looks unbeatable right now, due to its deep portfolio of hardware partners, extensive distribution channels, and a wide range of low-cost apps like Gmail," said Neil Mawston, executive director at Strategy Analytics.